Another argument for intervening against ISIS, in Iraq at least, was that we owed it to the people of Iraq (including but not limited to our Kurdish allies) to protect them from some of the unintended consequences of our actions. But the United States has arguably done more, historically, to destabilize Mexico than it has done to destabilize Iraq, so we probably owe them more. Moreover, while we don’t buy oil from ISIS, our population does buy a vast sea of illegal drugs from the Mexican cartels. We are directly fueling and arming this conflict in Mexico. This is the most egregious and unjustifiable strategic blind spot the United States currently has anywhere in the world. Every argument raised for the aggressive response toward ISIS could have been (and still can be) made toward the ongoing conflict in Mexico, and yet only one situation earned the response. That should raise serious questions about U.S. policy in both places, as well as questions about how we assess threat severity and then how we handle it. 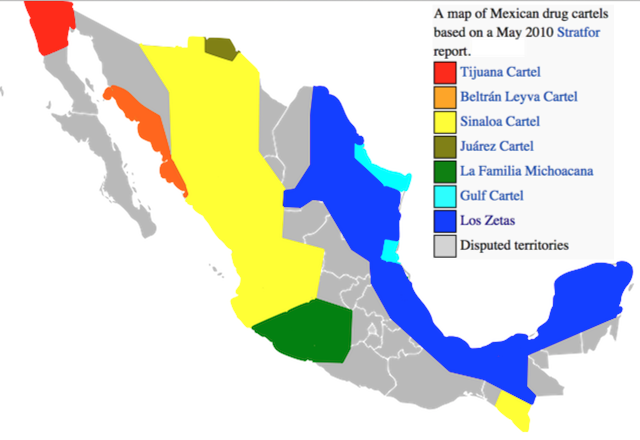 Tagged Iraq, ISIS, Islamophobia, Knights Templar (cartel), Latin America, Los Zetas, Mexican cartels, Mexico, Middle East, narcoterrorism, Sinaloa, Syria, United States military, War on Drugs.